GNLU invited applications for recruitment to 13 Professor & Other posts. The candidates eligible for the post can apply through prescribed format on or before 09 November 2016. 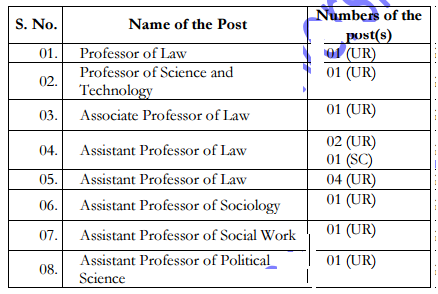 Gujarat National Law University (GNLU) Job Notification: GNLU invited applications for recruitment to 13 Professor & Other posts. The candidates eligible for the post can apply through prescribed format on or before 09 November 2016. Educational Qualification for Professor Post: A. (i) An eminent scholar with Ph.D. Degree in the concerned/allied/relevant discipline and published work of high quality, actively engaged in research with evidence of high quality published works with a minimum of 10 publications as books and/or research/policy papers. (ii) A minimum of ten years of teaching experience in university/college, and/or experience in research at the University/National level institutions/industries, including experience of guiding candidates for research at doctoral level. (iii) Contribution to educational innovation, design of new curricula and courses, and technology mediated teaching learning process. (iv) A minimum score as stipulated in the Academic Performance Indicator (API) based Performance Based Appraisal System (PBAS) of UGC OR B. An outstanding professional, with established reputation in the relevant field, who has made significant contributions to the knowledge in the concerned/allied/relevant discipline, to be substantiated by credentials. Educational Qualification for Associate Professor Post: (i) Good academic record with a Ph.D. Degree in the concerned/allied/relevant discipline. (ii) A Master’s Degree in Law with at least 55% marks (or an equivalent grade in a point scale wherever grading system is followed) from any recognized University or an equivalent degree from any foreign University. (iii) A minimum of eight years of experience of teaching and/or research in an academic/research position equivalent to that of Assistant Professor in a University, College or Accredited Research Institution/industry excluding the period of Ph.D. Degree research with evidence of quality published work and a minimum of 5 publications as books and /or research/policy papers. (iv) Contribution to educational innovation, design of new curricula and courses, and technology mediated teaching learning process with evidence of having guided doctoral candidates and research students. (v) A minimum score as stipulated in the Academic Performance Indicator (API) based Appraisal System (PBAS) of UGC. Educational Qualification for Assistant Professor Post: (i) Good academic record with at least 55% marks (or an equivalent grade in a point scale wherever grading system is followed) at the Master’s Degree level in a relevant subject from an Indian University or an equivalent degree from an accredited foreign university. (ii) Minimum four years’ experience as an Assistant Professor in scale of ₹ 15600-39100 AGP ₹6000/- with Ph. D. Degree in the relevant discipline. OR Minimum five years’ experience as an Assistant Professor in scale of ₹ 15600-39100 AGP ₹ 6000/- with M.Phil. degree in relevant discipline. OR Minimum six years’ experience as an Assistant Professor in scale of ₹ 15600-39100 AGP ₹ 6000/- with Master degree in relevant discipline with NET/SET/SLET. Interested and eligible candidates are required to send their application in the prescribed format. Duly filled in application form with the relevant supporting documents shall be sent to “The Registrar, Gujarat National Law University, Attalika Avenue, Knowledge Corridor, KobaGandhinagar, Gujarat 382007, India”.